← Quick & Healthy… Sweet Treat, Broiled Grapefruit! Quick and Healthy… Meatless Monday! Through my work with my Wellness and Lifestyle groups I have the amazing opportunity to experience cooking and eating meals with my clients. For me this is one of the most intimate ways to really get to know my clients because I see their strengths, personalities and relationships with food. I would never have been able to get to really know all of that sitting behind a desk talking with them. Wellness and Lifestyle Group cooking demonstration. Currently in our Wellness and Lifestyle groups we have all of our patients watch the documentry Forks Over Knives. The film “examines the profound claim that most, if not all, of the degenerative diseases that afflict us can be controlled, or even reversed, by rejecting our present menu of animal-based and processed foods.” The film has impacted so many of my clients to start to explore the idea of including more vegetarian proteins in their meals and snacks. My goal with showing this film is not to turn all my clients into vegetarian or vegans, I am certainly not one. Rather to change my clients thinking and start to see that a meal can be yummy and delicious without including meat. And if my clients can do this, once a week, a few times a week or maybe all week, their life expectancy will increase significantly. 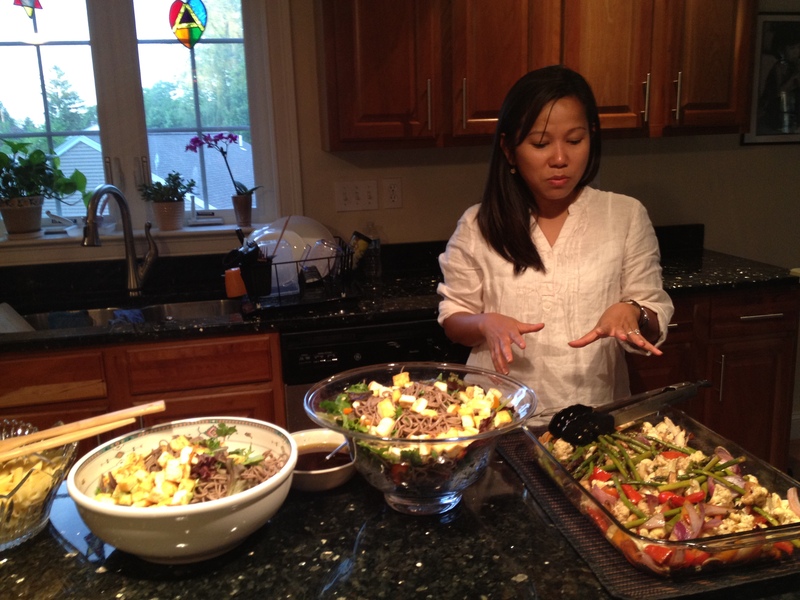 Recently we had a Forks Over Knives dinner with our Wellness and Lifestyle groups. The physician I work with Dr. Altman, invited our group over to his home for a fabulous vegetarian meal and cooking demonstration by his wife. 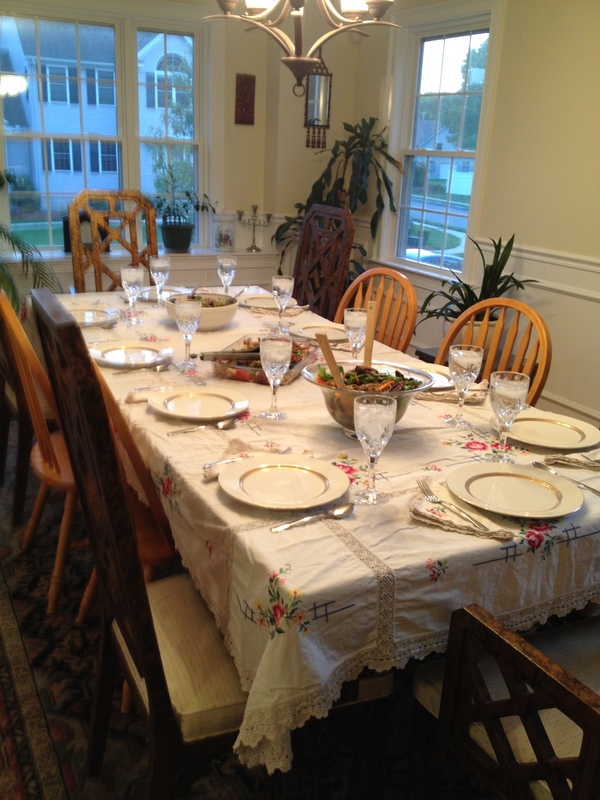 After the demonstration we sat down to a lovely dinner table to share a meal, and enjoy a good conversation. 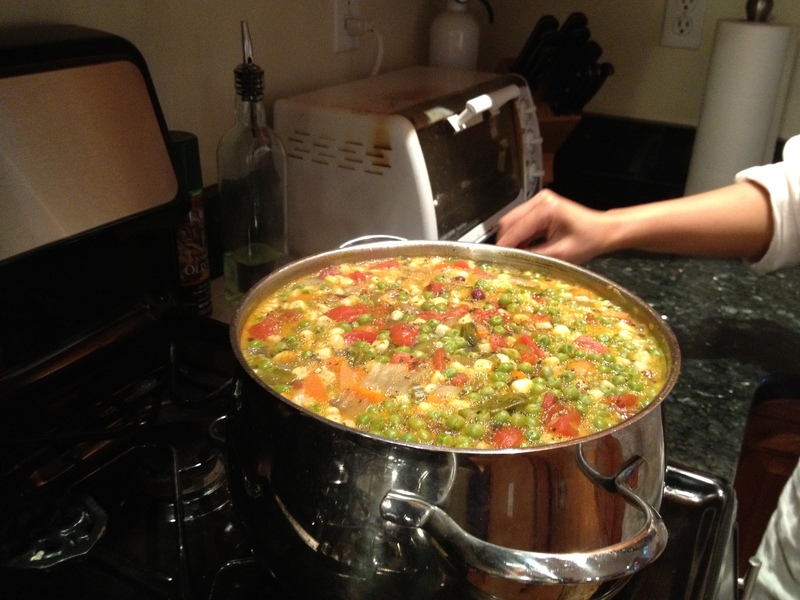 Our meal started off with Vegetarian Minestrone Soup. This by far is one of the best soups I have had in a very long time. The beans and vegetables were soft, but not too mushy, the spices and herbs added a great deal of flavor, and it was not too salty. 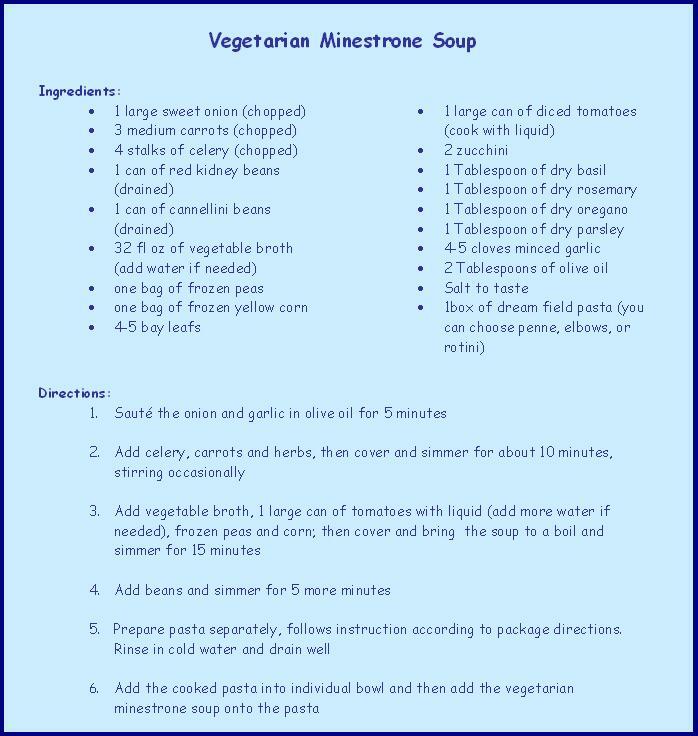 The soup took less than an hour to cook and would be a great recipe to use for your Prep-Day. The soup was a first course for us, but could certainly stand alone as a meal. We followed our vegetarian minestrone soup with a meal of tasty vegetables, tofu and noodles. Our main dish was a new dish to me, but I will certainly be making it again to share with my family, Spicy Thai Soba Noodle Tofu Salad. Soba noodles are a great alternative to pasta. Due to their buckwheat content they are a slow-releasing carbohydrate. The soba noodles are half the calories and carbohydrate compared to white-flour pasta. A cup of soba noodles has 113 calories and 22 grams of carbohydrate; a cup of white-flour pasta has 200 calories and 44 grams of carbohydrate. The homemade dress for the dish was so simple to make and added great flavor without downing the fresh greens. Finally the fresh cilantro added a burst of flavor in every bite. 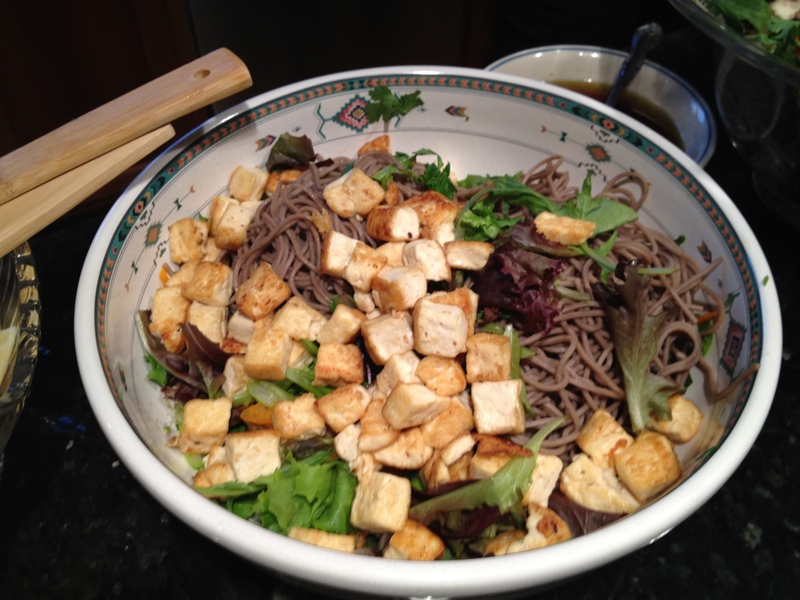 For many of our clients this was their first experience with tofu and soba noodles. I will not say they were 100% tofu converts, but I think this opened their eyes to trying tofu again. Around the table we shared experiences around the first time trying new foods. We discovered how the first bits are always so challenging to get past with new foods, especially as adults. Yet as we keep trying new foods the taste and textures grew on us, and often become some of our favorite foods today. Tofu was one of those foods for me! Our Spicy Thai Soba Noodle Tofu Salad was accompanied by Roasted Vegetables, something I love to make. 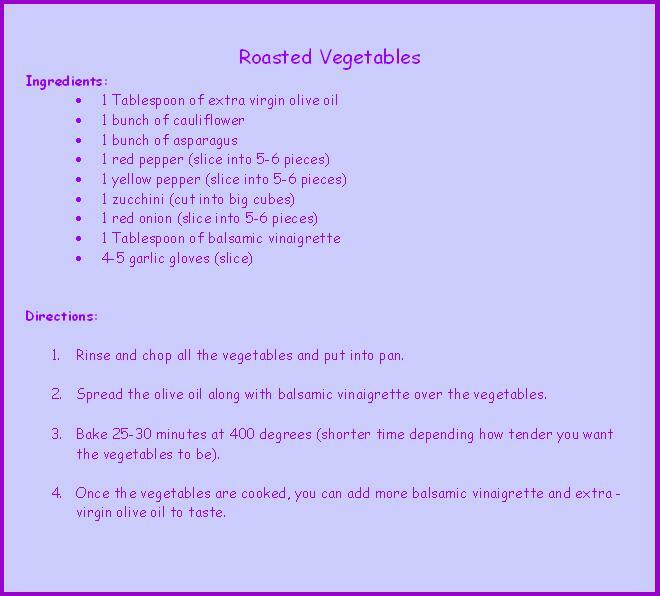 What I have not done with my roasted vegetables is use balsamic vinegar. That added a sweetness and tang to the vegetables that was delicious. 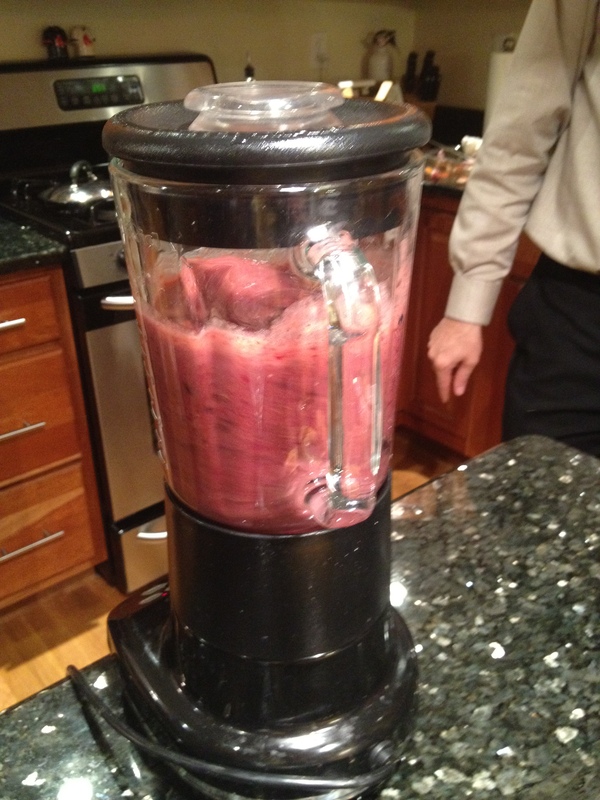 We finished our lovely meal off with homemade smoothies made by Dr. Altman, aka Smoothieologist. Dr. Altman prides himself on making fabulous smoothies and finding the perfect combination of fruits, for fun and exciting flavors. (Look for future post about the perfect smoothies for summer). My challenge this week for you is, to pull up some chairs. Lose the TV. Let the phone go unanswered. And see where the moment takes you as you explore meatless meals, and start by adopting Meatless Mondays! This entry was posted in Meatless Mondays!, Quick & Healthy, Uncategorized and tagged Cooking, meatless mondays, Vegetarian, Weight loss, wellness group. Bookmark the permalink. 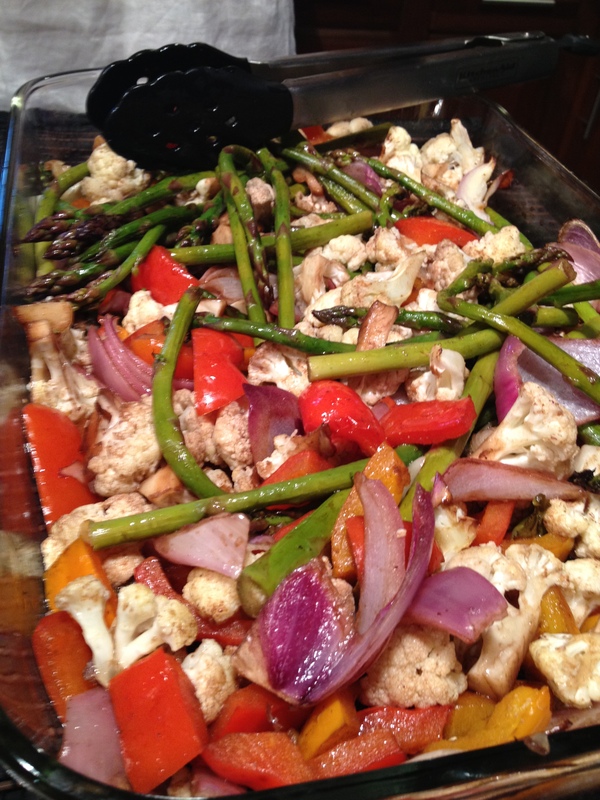 4 Responses to Quick and Healthy… Meatless Monday! The meal was every bit as good as the photos suggest, surpassed only by the hopitality of the Altman family (kids included!!). 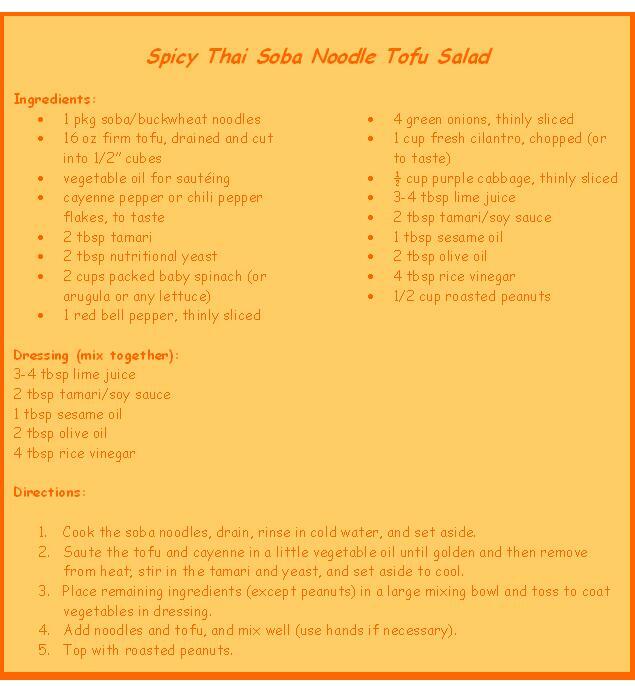 I’m doing the Soba Noodle Tofu Salad and the Roasted Veggies this weekend. Vegetarian protein is great and as an alternative to animal protein. i always think that vegan is much healther. “;”`.